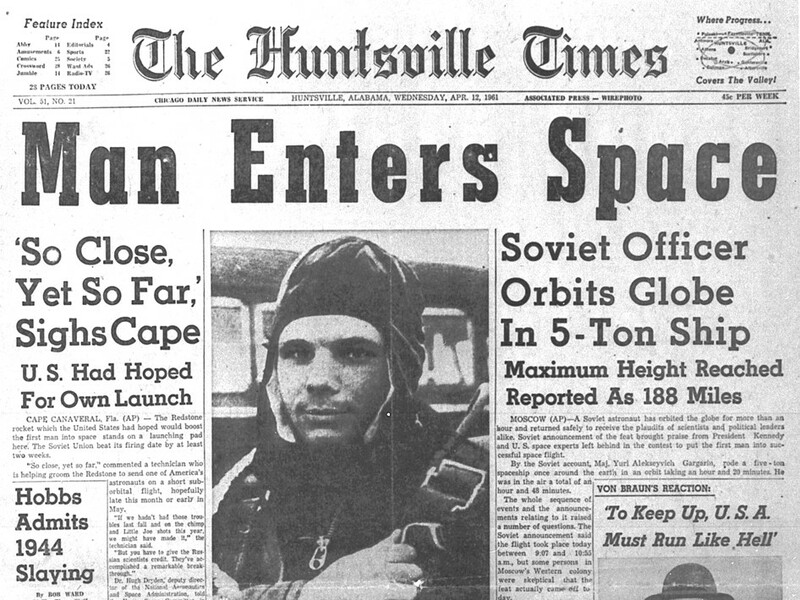 Soviet Cosmonaut Yuri Gagarin was ‘officially’ the first man into space. But did Gagarin really go into space? Kennedy warmly congratulated Khrushchev for their achievement, but the fact that Kennedy did not contest this exploit was seen by the Russian people, and the whole world, as the confirmation that Gagarin’s exploits was fact. Gagarin was systematically announcing his progress on the flight too early, which strongly suggests that his voice was coming from a recording that had been started too early, and which also explains the de-synchronisation between his voice and the corresponding events. 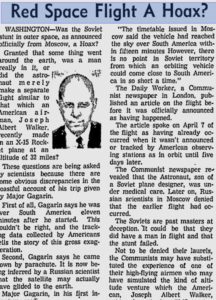 Gagarin said that he was flying over South-America only fifteen minutes after he departed, when he needed in fact at least forty-five to get there. He also stated that he could distinctly see the Russian farms and meadows when he was at an altitude of 200 miles, at which altitude this was impossible. Gagarin said he could see the earth through his porthole when the chief of the Russian program said in a meeting that his cabin had no portholes, only tiny slits. And, instead of landing inside his space cabin, landed by parachute, at the exactly spot where he had done his parachute training, while his ‘space-ship,’ Vostok, was crashing far away and seriously damaged. It appears impossible that Gagarin could have ejected himself from his space cabin, and there is evidence that he was dropped from a plane. There are also many other anomalies, such as the fact that Gagarin was viewed from four angles in his cabin, when it was clearly stated that there only were two cameras present – and the fact that his official photo showed him with a bruise near one eye that he only acquired several months after the flight. In addition, Gagarin seemed to have a very poor memory about the events. For example, he wrote in his memoirs that he was wearing a blue suit during his exploit… whereas the Russian authorities said he had an orange suit and he is clearly pictured in this orange suit. Up until 1961, the United States had managed to launch 42 satellites, the Soviet Union only 12 and the US had also informed the world that Alan Shepard would be the ‘first man in space’ on 5th May 1961. Was the Soviet Union therefore forced to do something to ‘save face?’ It may have been for this reason that a Soviet cosmonaut, Vladimir Ilyushin, was launched into space on 7th April 1961. The Americans intercepted several radio communications between him and the space centre in the Soviet Union and Ilyushin crash-landed and was seriously injured. He could not therefore be shown to the public and it was claimed that he had been injured in a car accident. He was sent to China to receive medical treatment. The Russian TV documentary ‘Cosmonaut Cover-Up’ (2001) also claimed that on that day, Vladimir Ilyushin left for space, got into trouble during the first orbit, and crash-landed in China during the third orbit. Ilyushin was badly injured and was returned to the Soviet Union a year later. Ilyushin was later killed in an ‘engineered’ car accident, that same year. However, the Soviet Union did not have a spare capsule at that time and so it was decided to orchestrate a huge bluff, a cosmic lie. 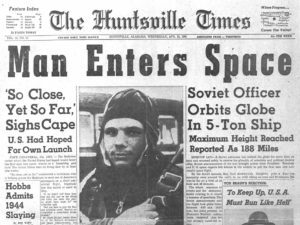 Radio Moscow claimed that a Soviet cosmonaut, Yuri Gagarin, had been sent into space on the morning of 12th April 1961 and according to the official announcement, he had already landed and was in fine health. The whole world believed this except for the Western intelligence services. They had not managed to detect any radio communication whatsoever, between Gagarin and the space centre. In fact the hoax was sloppily orchestrated. 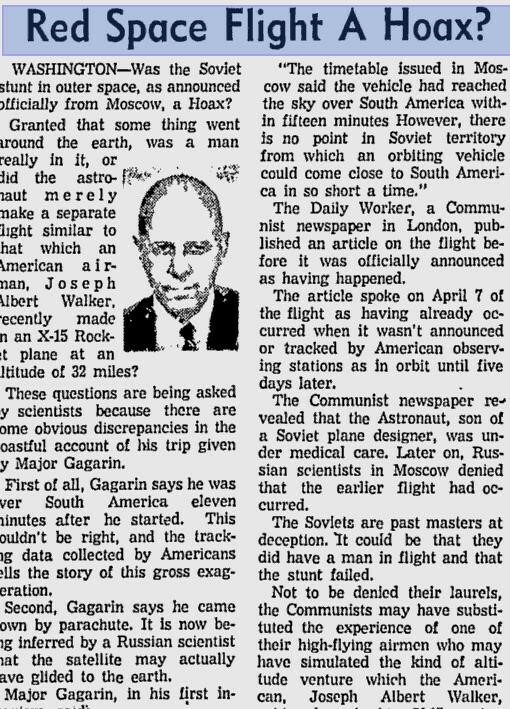 Polish newspapers had already announced that morning that a Soviet cosmonaut had been into space and newspapers in other countries did not report Gagarin’s flight until the next day. In a book written for western consumption, Soviet propagandists claimed that simple peasants recognised Yuri Gagarin soon after he landed in the field and enthusiastically shouted… “Gagarin, Gagarin!” But at that time Gagarin was unknown to the public, nothing about his exploits had yet been reported at that time, no pictures of him had ever been published and his name had not been mentioned. The message from radio and TV was sent out 35 minutes after the alleged journey. Maybe the peasants were psychics? Even unmanned Soviet space probes had photographic equipment on board. It would have been an important propaganda triumph to publish Gagarin’s pictures from space and the Soviet Union would never have missed an opportunity like that. Shepard’s pictures were cabled out immediately and parts of his flight were also shown on TV. When Gagarin naively expressed his wishes to travel in space ‘for real’ in 1968, he was disposed of, according to Istvin Nemere. His plane exploded on 27th March that same year and the official crash report contained many contradictions and anomalies. The report was classified during the communist period but it claimed that there was not much left of Gagarin’s body after the crash. In that case, how did his flight-suit come to land in the top of a tree? There are far too many questions surrounding Gagarin’s spaceflight in April 1961 and his subsequent ‘accidental’ death. A British team of researchers who questioned the propaganda surrounding manned journeys to the moon also confirmed this information. But when, if ever, will the truth be admitted officially? Although researchers, politicians, and journalists have all doubted the veracity of the story of Gagarin having conquered space, NASA was strangely the only authority to vouch for the authenticity of the scam. From what we have learnt so far about the ‘Gagarin Hoax,’ it was thanks to NASA’s sponsorship that the hoax was finally accepted by the US. And three weeks later, on 5th May 1961, the Americans launched their first man into space, Alan Shepard. So, why did the Americans accept losing out in the prestigious race to put the first man in space, when they had all the cards in their hand to prove the Russian hoax? Well here is a possible clue… Some weeks later, after the pseudo-Gagarin flight, Kennedy made a major speech announcing that the Americans would put a man on the moon before the end of the decade. Before the end of the decade? Impossible surely at that time, so how could he be so certain when the difficulties were so great, and the technology still so relatively primitive? Yet, Kennedy warmly congratulated Khrushchev on Gagarin’s feat, which allowed the USSR to make huge political capital of it. It is certain that Kennedy was warned the same day by NASA that Gagarin’s exploit was a fraud and could easily be proven a fake so, what inspired Kennedy to boost the Russians by accepting what he knew to be a hoax, and why did it modify his attitude in the invasion of the Bay of Pigs? It now appears very clear that the Gagarin’s fake voyage pushed Kennedy to deliberately sabotage the invasion by planning for it to fail. If Kennedy had allowed it to succeed, it would have diminished the value of the ‘gift’ that he had made to the Russians in turning a blind eye to their hoax. So, from this it is possible to conclude that Kennedy was expecting an important favour in return from the Russians, as before the hoax, Kennedy showed no signs that he would allow the Cuban invasion to fail. One of the main arguments we hear in disputing the fact that the moon landings were nothing more than an elaborate hoax, I would suggest, is the claim that if the moon landings had been fake, then the Russians, who definitely had the capability of tracking the American spaceships would have soon exposed them as a scam. Of course, Kennedy also realised this and was only going along with the Russian’s claim on the first man in space, in order to give credibility to the claimed moon landings, which at the time was still eight years away. But was allowing the Russians to claim ‘the first man in space,’ enough to counter-balance the prestige of landing the ‘first man on the moon?’ Kennedy reasoned that it may well not be sufficient and that he would no doubt have to grant the Russians some other favours to definitively ‘seal the deal’ about the future Apollo project. So, the refusal to support the invasion of the Bay of Pigs was the first of these other favours. 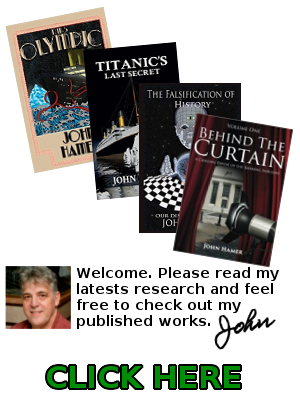 Kennedy also had to ensure the silence of ‘insiders.’ Had he appointed an honest, patriotic American engineer, he would probably not have accepted the subterfuge and may have exposed it. And so, this was why Kennedy appointed as director of the project, a man that he was sure he would be loyal to him, and would not disclose the fakery, for the simple reason that this man was indebted to Kennedy as Kennedy was protecting him from justice, as had the previous presidents all the way back to the end of WWII. That man was Wernher von Braun, the erstwhile Nazi war criminal.